Despite government claims that it has been increasing the budget for education, still the public school system is hardly coping with the shortages, and state universities and colleges have been raising tuition, thereby making tertiary education inaccessible for the poor. MANILA – The administration of President Benigno Aquino III said that the Philippines has “undergone a radical transformation” in the past three years. But for public school teachers, that transformation did not solve the problems besetting the ailing public school system. The Alliance of Concerned Teachers (ACT) said that under Aquino the public school system’s existing shortages are still not being addressed and has been further aggravated by the hasty implementation of the new K+12 curriculum. “The government boasts of zero backlog in classrooms, chairs and textbooks and has purportedly addressed the gap in the shortages of teachers. In his fourth state of the nation address (SONA) on Monday, Aquino will surely boast about the hiring of 56,085 new teachers for the 61,510 teaching items for this year,” the group said in a statement. But during the opening of classes last June, the massive shortages in textbooks, chairs and classrooms were evident most specially in Metro Manila. The Department of Education’s (DepEd) data shows that shortages in classrooms are pegged at 19,579, 60 million shortages in textbooks, 2.5 million shortages in chairs and 80, 937 shortages in water and sanitation facilities while 770 schools in Metro Manila, Cebu, and Davao are overcrowded. The DepEd recently said in a news release that 91 percent of the 61,510 shortage of teachers have been filled up while the 5,425 appointments are being processed. France Castro, secretary general of ACT said that so far, this is the largest number of teachers hired to address the shortage. “This has been our long time call (to address the shortages), but this is just half of what public schools really need,” Castro told Bulatlat.com. According to Castro there is a serious need to address the number of out of school children. According to UNESCO’s data, the Philippines has 1.4 million out of school children. The Philippines is the only ASEAN country that is included in the top five countries with the highest number of out of school youth. 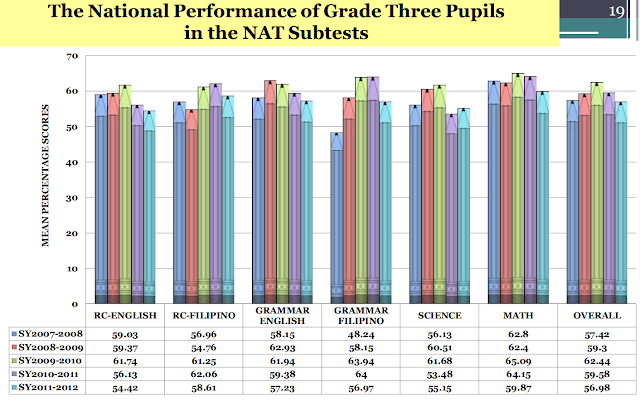 The DepEd’s 2012 data showed a 6.38 percent dropout rate in primary school and 7.82 percent in secondary. “The increasing number of out of school children is being caused by poverty. The price increases in prices of oil, electricity, rice, water and other basic commodities are further pushing the poor into dire poverty,” ACT said in a statement. As more families have become poorer, more students are enrolling in public schools, particularly high school. This, according to ACT, has exerted tremendous pressure on the smaller number of high schools. At present, there are 38,503 elementary schools while there are only 7,470 high schools. The group also blames militarization in the country side for forcing students to stop schooling. While the public school system in the Philippines still to suffers from the shortages, the Aquino government has implemented a policy that, according to Castro, does not benefit the people. Castro is referring to the implementation of the K to 12 curriculum, which only contributed to the perennial shortages in the country’s public schools. “Teachers, classroom, textbooks, toilets, and sanitation facilities are still lacking. The implementation of K to 12 has only aggravated the existing problem by immediately implementing the policy without proper preparation,” Castro said. The K to 12 program is the flagship program of the Aquino administration. It was implemented in 2010 mandating five-year-old pupils to be enrolled in Kindergarten. The K to 12 was implemented without a law and without additional teachers for Kindergarten, as well as classrooms. The K to 12 law was only signed by Aquino May of this year. 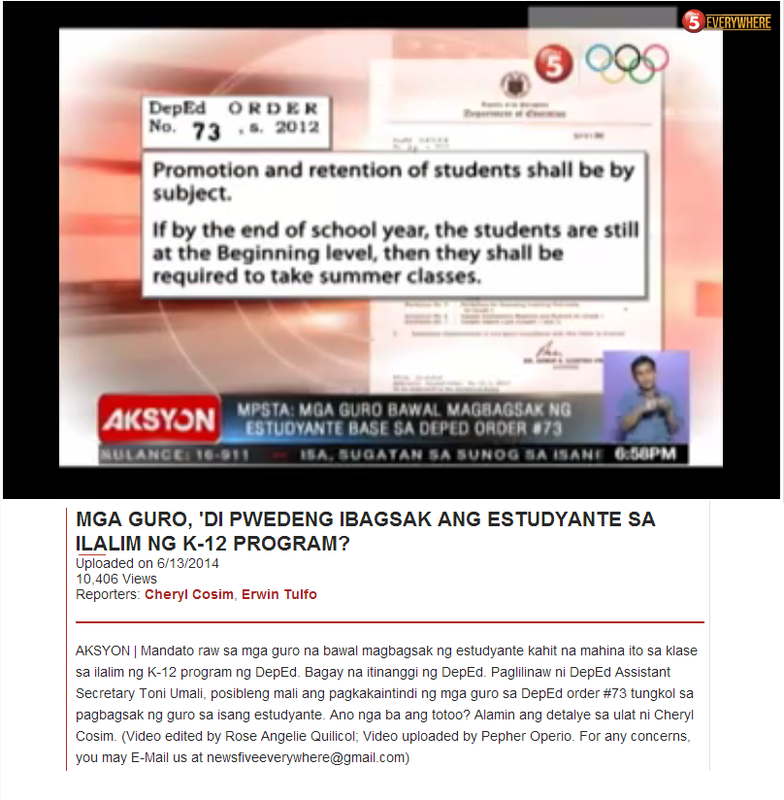 “This new curriculum will not benefit teachers, the students and the Filipino people. It is more of a burden. It doesn’t serve the interest of the people,” Castro said referring to the two years additional school year of students. Furthermore, she said the K to 12 only aims to produce semi-skilled workers for work overseas. Up to now, the government has not responded to the teachers’ call for salary upgrading. “The teachers’ salary of P18,549 ($428.18) cannot cope up with the continuing increase in prices of basic commodities,” Castro said. What is worse, Castro added, is that the government reduced their benefits. “The P10,000 ($230.84) Personnel Enhancement Incentives (PEI) that we have been receiving for the past years was reduced to P5,000 ($115.42). The Performance Based Bonus (PBB) which should be given in December has still not been released up to now,” Castro said. The teachers’ group stressed their call is for a salary increase and not a deceptive bonus that only divides government employees. “What we need is a salary upgrade,” Castro said. The tertiary education is also suffering from the government’s neglect. According to Charlotte France, councilor of UP Diliman student council, during the three years under Aquino, education has become a privilege rather than a right. “Under Aquino education has become commercialized. UP, for one, has increased its tuition to 1,500 ($34.63) per unit making it difficult for those who passed the UP college admission test to pursue their studies in UP,” France said in a forum last July 11. France blamed the non-allocation of enough budget for state universities and colleges (SUCs). These universities remain neglected, thus school administrators opted to increase tuition and other fees or come up with income generating projects that will augment their budget for their needs. This, despite the increase of budget to the SUCs for the year 2013. “Because of the lack of budget, idle assets of SUCs were sold or are being leased out to private entities. The UP Technohub, for one, was developed to generate funds. The land where the Technohub sits, is supposed to be a research field for the students. The only reason that it is idle is because the government does not allocate funds to utilize the assets for the students’ needs,” France said. She added, in UP Visayas, the 21 hectares of campus land are about to be converted into the Diwata Shore (DS) and Love Nature! Park (LNP). The said projects aim to attract tourists, local and foreign, to generate income for the university. France also criticized the Socialized Tuition and Financial Assistance Program (STFAP) as a scheme that only justifies the increase in tuition and other fees and the meager allocation for SUCs. She said, “Education is a right and not a privilege. The STFAP would no longer be needed if only the government is giving full subsidy to SUCs.” Under STFAP, France explained, a student has to provide a lot of documents to prove that the family is poor. Because there is a need to generate income for the university, the school administrators are implementing repressive policies such as the no late payment policy that pushed UP-Manila freshman Kristel Tejada to lose hope and end her life, France said. On March 15, Kristel Tejada, freshman student of UP-Manila killed herself using a silver cleaner after she was forced to file a leave of absence because they could not pay her tuition. “In 100 grade one pupils, only 66 finish grade six, 58 enroll in first year high school and only 43 graduate from fourth year high school. From these 43, only 23 enroll in college and only 14 can attain college degrees. This is how students are drastically reduced because of poverty and the expensive costs of education. This is the true state of the students,” France said. That is why, the scholars of the nation – all students of SUCs – should fight for their right to affordable and accessible education, France said. “With our collective action, we can attain our right to education that has or is being denied to many poor students.” The student leader is encouraging her fellow students to come and join the big rally on July 22 on the fourth SONA of Aquino. “As the 16th Congress will open on Monday, Aquino will once again boast his so-called achievements. People should gather on streets and show the government of what is the true state of the nation,” Castro said.